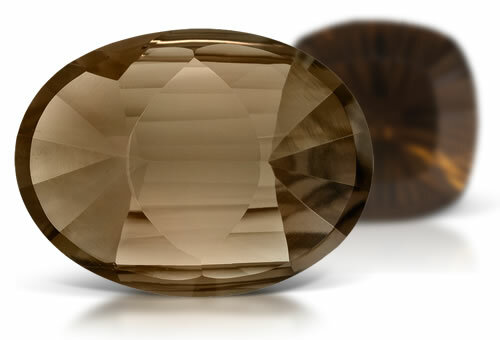 Smoky quartz is an earth-toned transparent quartz that comes in a variety of shades, including cognac. Smoky quartz gets its rich warm colors from color centers related to aluminum. A popular ornamental stone, it is often carved into figurines and ornate statues, but makes quite a statement when faceted into stunning gemstones. refractive index, birefringence, optic character and optic figure. Careful observation that reveals Brazil-law twinning separates citrine from scapolite with similar properties. Smoky quartz is the common variety name for transparent quartz with a predominantly brown color with low color saturation. The brown color is due to irradiation and it can be natural or induced by by man. Misnomers: smoky topaz, burnt topaz, Scotch topaz. Smoky quartz is a type II clarity stone. Color zoning often present in stones in the form of "tiger stripes" or "zebra stripes". Stones may contain crystals, negative crystals, liquid inclusions, two-phase inclusions and partially-healed fractures.